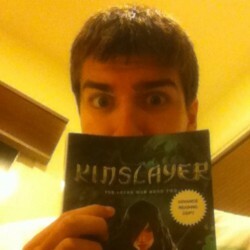 A Fairly Original Dystopian Novel - Scott Reads It! Check out Scott Reads It for reviews, giveaways & more bookish wonders! Thank you to HarlequinTeen for providing me with an advanced copy of Pawn in exchange for a honest review. 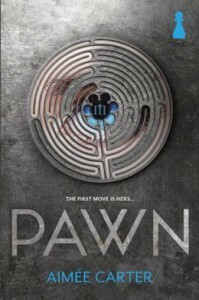 Pawn has one of the greatest concepts I've seen in the YA dystopian market recently. What if you had the chance to literally become someone else? Kitty has the opportunity to become Masked into Lila Hart, but this operation comes with dire consequences. I really applaud Aimme Carter for coming up with such a brilliant premise and delivering such a addicting novel. Before I could fully enjoy Pawn, I was hung up on minor details that really distracted the heck out of me while reading. First of all, I wasn't a fan of the name Kitty because it just felt wrong to have a character with such a ridiculous name. The name Kitty definitely grew on me and by the end, I think it definitely fit her personality and character arc. Another initial qualm I had was with Kitty's poor, first impression on the reader. I was annoyed by Kitty's angsty interactions with Benjy which really rubbed me the wrong way. I was so put off by those mostly negligible details that I really didn't feel like I could continue reading Pawn. Luckily, my read-along buddies pressured me to continue reading and I have to say that Pawn was definitely worth reading in the end. Once I overlooked the science of being Masked and my first impression of Kitty, I really started to enjoy reading Pawn. The first section of Pawn was such a struggle to get through, but I definitely devoured the rest of the book in a frenzy. I would tell myself just to read a few more pages and then I would end up reading chapters and chapters of the book. There were so many plot twists and surprises that I didn't predict and Carter threw in so many curve balls to keep the plot extremely interesting. Especially as readers start to reach the last portion of Pawn, it seems that nearly every chapter has an extremely shocking plot twist. The world-building in Pawn isn't as in-depth as I would like, but I have a feeling Carter will expand upon the world in future installments in this series. I was definitely impressed for the most part with the world Carter created in this book because it was extremely atypical. Though the whole exam that determines societal rank is nothing new (see Legend, The Testing and countless other titles) Carter put a nice spin on the idea to make this one standout from the crowd. I have no idea how Pawn stacks up against The Goddess Test novels because I have yet to read them, but after reading Pawn, I definitely want to move up the series on my "to read list". Carter has considerable writing abilities and I can easily why The Goddess Test books have become so renowned. Pawn has proven to me that Carter can write an extremely addicting book with tons of plot twists to keep readers on the edge of their seat.